Autocade hits 5,000,000 views: what are its most read and least searched? With Autocade exceeding the 5,000,000 page view milestone (it’s on 5·12 million), I thought it might be fun to look at a few of the models on the site: the most popular, the least loved, and the first on the site. Looking at the stats, here are the most popular models. These shouldn’t be surprising: for a long time, our page on the E100 Toyota Corolla was the most-read. That’s since been overtaken by the Ford Fiesta Mk VII, the Toyota’s rival, the Nissan Sunny (B14), and the older Nissan Bluebird (910), probably thanks to a link from Wikipedia. 1. 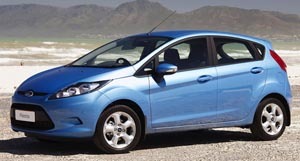 Ford Fiesta (B299/B409). 2008 to date (prod. over 1,000,000 Europe only to March 2011). 3-, 4- and 5-door saloon. F/F, 999 cm³ (I3 DOHC), 1242 cm³ petrol, 1399 cm³ diesel (I4 OHC), 1388, 1596 cm³ petrol, 1498, 1560 cm³ diesel (I4 DOHC). Ford’s global small car, part of European Fiesta lineage with nameplate returning to North America for the first time since 1980. Four-door for Asian and North American markets. Regarded as class leader, excellent chassis and handling. Showed small-car interpretation of ‘kinetic’ design theme which débuted on larger Ford Mondeo Mk IV. Minor facelift in 2010, more substantial, Aston Martin-esque facelift in 2012, with Ecoboost three-cylinder and 1·5 diesel added. 2. 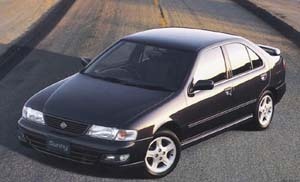 Nissan Sunny/Nissan Sentra (B14). 1994–2000 (prod. n/a). 4-door sedan. F/F, F/A, 1295, 1497, 1597, 1838, 1998 cm³ (I4 DOHC), 1974 cm³ diesel (I4 OHC). Undistinguished front-wheel-drive sedan with more limited markets; Europe and many western markets were now selling only the Pulsar (as the Almera). No station wagon as Sunny range trimmed. Sold in numerous Asian countries. Sentra in México, with 2·0-litre option. In production in Thailand till 2000. Coupé called Lucino in the home market, a separate line. 3. Nissan Bluebird (910). 1979–86 (prod. n/a). 4-door sedan, 5-door wagon, 2-door coupé. F/R, 1595, 1598, 1770, 1809, 1952 cm³ petrol, 1952 cm³ diesel (I4 OHC), 2393 cm³ (I6 OHC). Squared-off Bluebird began Nissan’s 1980s’ rise, dropping its alphanumeric model codes in many markets. Badged Datsun for export initially, with Nissan badges appearing in 1981. Sold in US as 810, 810 Maxima, and then Maxima from 1982. Conventional, despite sharp, boxy styling. End of Japanese production 1983. Facelift in Australia in 1985. 4. Toyota Corolla/Holden Nova (E100). 1991–9 (prod. n/a). 4-door sedan, 5-door liftback sedan, 4-door hardtop, 3- and 5-door hatchback sedan, 5-door wagon, 5-door high-roof van, 2-door coupé. F/F, F/A, 1296 cm³ petrol, 1974 cm³ diesel (I4 OHC), 1331, 1497, 1498, 1587, 1762 cm³ (I4 DOHC). Dr Akihiko Saito, in charge of the Corolla programme, wanted to create the most refined Corolla possible, with Lexus-style comfort. To some degree, the team succeeded, but the car’s price went up in Japan during a recession. Roomy, but heavy, and less competitive alongside other small cars, including Koreans. Sales were initially slow. Longer wheelbase. Short-tail hatchbacks still Corolla FX in Japan. Liftback actually part of Sprinter range in Japanese home market. Four-door hardtop coupé from 1992 called Corolla Ceres. 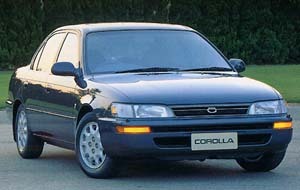 Last Corolla built in Australia, where it was also the Holden Nova from 1994 to 1996. 5. Toyota Corolla/Toyota Huaguan/Toyota Limo (E120). 2000 to date (prod. n/a). 3-, 4- and 5-door sedan, 5-door wagon, 5-door minivan. F/F, 1364 cm³ diesel (I4 OHC), 1398, 1598, 1796 cm³ (I4 DOHC), 1995 cm³ diesel (I4 DOHC). Corolla grows to its biggest size up to that point but limited by Japanese taxation requirements (setting the maximum width to 1,700 mm before it goes into a higher tax bracket). Shortened Toyota Vista (V50) platform, 2,600 mm wheelbase. Torsion beam axle at rear, replacing independent rear suspension. 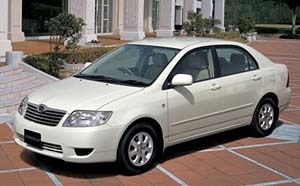 Sedans sold as Corolla Altis in some Asian markets. Wagons named Corolla Fielder, with hatchbacks taking Corolla Runx and Allex names (the latter replacing Sprinter). Corolla Spacio denoted a minivan model, sold as Corolla Spacio in Europe. Toyota Matrix, a different small van or tall hatchback, sold in US, renamed Corolla Matrix in 2005. Platform shared with Pontiac Vibe (or Toyota Voltz). Competent small car, hatchbacks in fact quite stylish, though interior design dull. Mid-life facelift 2004 in Japan. Japanese production ended 2006; some other countries 2008; continuing in China into the 2010s as Corolla EX, running alongside E150 successor. But what of the least popular? It’s unfair to go to the bottom of the statistics’ page, because you’re going to get a newer page that might become popular later. The following four are models which I’ve seen at the bottom of that page even after they had been on the site for a while, suggesting not too many are searching for them. 1. Riich X1. 2009 to date (prod. n/a). 5-door sedan. F/F, 1297, 1497 cm³ (I4 DOHC). 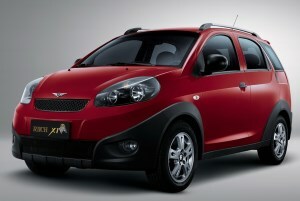 B-segment city car with SUV looks, exported as Chery Beat to some countries. 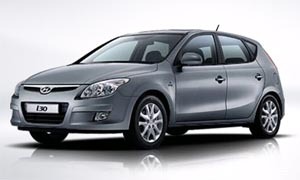 Meant to have been absorbed into the Chery range when the Riich marque was killed off in 2013, and continued to appear on Chery’s export site, though it vanished from domestic listings. Based on the Riich M1. 2. 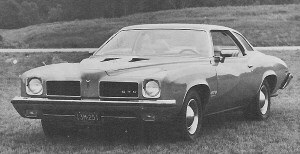 Pontiac LeMans. 1973–7 (prod. n/a, incl. 4,806 GTO). 2-door coupé. F/R, 231 in³ (V6 OHV), 250 in³ (I6 OHV), 260, 301,350, 400, 455 in³ (V8 OHV). Unreliable, thirsty GM Colonnade model line, with poor gas mileage (improving somewhat for 1975). GTO offered as an option for one year only, and more driveable than other LeManses and even previous GTOs, but fans tended to forget this model. Luxury LeMans for 1973 and 1974, renamed Grand Le Mans in 1975. 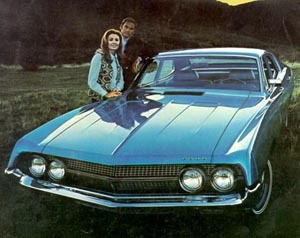 Related to Pontiac Grand Am (1973–5), and other GM intermediates including Buick Century (1973–7), Oldsmobile Cutlass (1973–7) and Chevrolet Chevelle (1973–7). 3. Buick Park Avenue (WM). 2007–12 (prod. n/a). 4-door sedan. F/R, 2792, 2986, 3564 cm³ (V6 DOHC). Chinese-assembled version of Holden Statesman (WM), but with differences such as visually large grille, different bumpers, and no indicators and vents in wings aft of the front wheels. Smaller Australian-built 2·8-litre unit related to one from Cadillac CTS available on Chinese edition, along with 3·6 from Holden Commodore (VE), later both replaced by 3·0. Otherwise mechanically similar to Statesman. Killed off in 2012 due to slow sales. 4. Chevrolet Monte Carlo (W-body). 1995–9 (prod. 376,483). 2-door coupé. F/F, 3135, 3791 cm³ (V6 OHV), 3350 cm³ (V6 DOHC). Chevy brings back the Monte Carlo nameplate for a two-door version of the Lumina. Z34, with extra equipment, featured DOHC V6, replaced by smoother but less powerful 3·8 in 1998. New four-speed auto in 1997. Good value for money, and a comfortable, long-distance cruiser. Average in terms of reliability. Finally, the oldest photos on the site tell us which articles I wrote first. A few of the oldest photos have been replaced for quality reasons, but it’s safe to say the following five cars were among the original ten or dozen entered on to Autocade. 1. Renault Mégane (X84). 2002 to date (prod. n/a). 3-, 4- and 5-door saloon, 5-door estate, 2-door coupé–cabriolet. F/F, 1390, 1598, 1998 cm³ (I4 DOHC); 1461, 1870 cm³ diesel (I4 OHC). 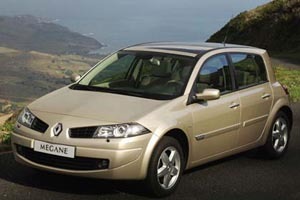 Surprising shape for 2002 launch, a total departure from earlier Mégane, with Renault designers showing their creativity. Hatchbacks have vertical tailgate with a bustle; saloon, estate and coupé convertible more conventional. Successful seller for Renault not just in home market, but in Germany. Revisions to range 2005. As before a Scénic minivan offered but this time in short- and long-wheelbase (Grand Scénic) versions, though not marketed as a Mégane despite ‘Mégane’ tag appearing in the C-pillar. (See separate entry at Renault Mégane Scénic II.) Turbo model claims 165 ch; RS delivers 225 ch. Hatchbacks replaced 2008 in France, estate in 2009. Saloon replaced by Fluence in South America 2011, though continued in Iran at Pars Khodro with 1600 and 2000 models; Grand Tour (estate) in Brazil to 2013. 2. Trabant P601. 1964–91 (prod. 3,000,000 approx.). 2-door saloon, 3-door estate, 2-door utility convertible. F/F, 595 cm³ (I2 OHV), 1093 cm³ (I4 OHC). East German subcompact car descended from DKW, made with cotton-based plastic (Duroplast) bodyshell. 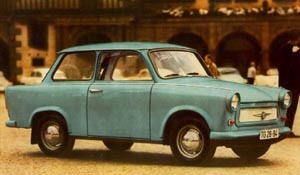 Sold in UK till 1965. Made with 595 cm³ engine (26 PS) until 1989 when larger and cleaner Volkswagen Polo 1·1-litre engine adapted under licence. Estate variant called Universal. Utilitarian “off-road” convertible model called Tramp. Kitsch value toward the end of its life as a relic of the DDR, but unloved for most years. 3. Ford Falcon (E240/FG). 2008–14 (prod. n/a). 4-door sedan, 2-door utility truck. F/R, 1999 cm³ (I4 DOHC), 3984 cm³ petrol, 3984 cm³ LPG (I6 DOHC), 4951, 5408 cm³ (V8 DOHC). 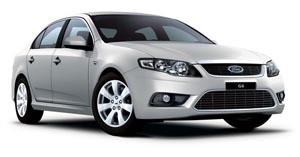 Extensively revised series launched in February 2008 with three grilles, for regular Falcon, G6 (which replaces the Futura and Fairmont nameplates) and XR. V8 engine restricted to sporty XR8 model only. No station wagon (EA169 platform carried over on facelifted model briefly). Very little change in fuel economy figures compared with predecessor. V8 produces 290 kW. FG designation supposedly meant to evoke memories of now-defunct Fairmont Ghia nameplate. Marketed as larger than Mondeo Mk IV, but in fact smaller in key dimensions except overall length. At time of launch, petrol models gained a five-star ANCAP safety rating, one up on its main competitor, the Holden Commodore (VE). EcoBoost turbo four from 2012, when FG also had a minor facelift. Smaller 5·0 Miami V8 for XR8 from 2013. 4. Ford Falcon. 1970½ (prod. 26,000 approx.). 2- and 4-door sedan, 5-door wagon. 250 in³ (I6 OHV), 302, 351, 429 in³ (V8 OHV). For half a model year (built January–August 1970), Ford transferred its Falcon nameplate from the compact model to the intermediate Torino–Fairlane bodyshell (117 in wheelbase for sedans; curiously, the wagon was on 114 in), making the Torino’s engine options available. Still marketed as an economy car, the last American Falcon is characterized by its swooping design. After 1970, Falcons were made only in Australia and Argentina (with an assembly plant for Australian models in New Zealand). 5. Hyundai i30 (FD). 2007–11 (prod. n/a). 5-door hatchback, 5-door estate. F/F, 1396, 1591, 1975 cm³ petrol, 1582 cm³ diesel (I4 DOHC), 1991 cm³ diesel (I4 OHC). First Hyundai designed specifically for Europe, rivalling Volkswagen Golf. 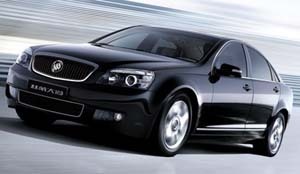 Designed in Rüsselsheim, Germany with excellent dynamics, among the best for the Korean brand. Quality survey in Germany in 2010 put the car at the top. Estate added at end of 2007 and sold in some markets as Hyundai Elantra Touring. Sister car to Kia Cee’d (2006–12), released earlier, but lacks that model’s three-door hatchback style. Best information about the cars. I loved them all.